How a Flyball or Centrifugal Governor Works? 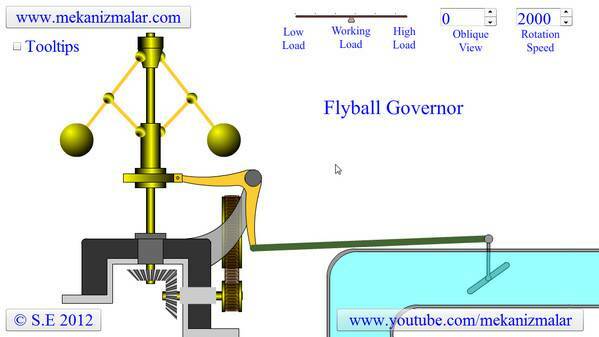 The Flyball Governor ( or Centrifugal Governor ) shown in this video is animation of this device from a steam engine. Power is supplied to the governor from the engine's output shaft by a belt connected to the flywheel. The governor is connected to a throttle valve that regulates the flow of steam supplying the prime mover. This in turn regulates amount of pressure acting on the piston. As the speed of the prime mover increases, the central spindle of the governor rotates at a faster rate and the kinetic energy of the balls increases. This allows the two masses on lever arms to move outwards and upwards against gravity. If the motion goes far enough, this motion causes the lever arms to pull down on a grooved collar, which moves a operating arm, which reduces the aperture of a throttle valve. The rate of working-fluid entering the cylinder is thus adjusted and the speed of the prime mover is settled in new position, preventing over-speeding or stalling the engine. Mechanical stops may be used to limit the range of throttle motion which is not shown in this animation. I like it. I want to use this animation. this video is very helpful. im working on my thesis right now, and my thesis is talking about governor. i want to ask some questions, would you like to reply to my email? If the setting comes loose and you have to readjust it then where do you start? What is the Actual adjustment procedure if you don't know the starting point? I like it..very useful to us..
i really enjoyed working with this tool it really helped me with the unit I was working on and I feel so much smarter.